Iran, Dec. 4, 2018 - On Tuesday, the workers of Iran National Steel Industrial Group demonstrated in Ahvaz, Khuzestan province, where the steel factory is located. This is the 25th consecutive day of strikes and demonstrations by the steelworkers of Ahvaz, who have been demanding job security and their overdue wages for months. One of the protesting workers said, “We will reclaim our rights and unpaid salaries. The mafia will be dismantled by the workers.” In their protests, the workers have been comparing government officials to mafia and criminal gangs for trampling the rights of workers to their own benefit. In recent weeks, government officials have tried to dissuade the workers from continuing their protests in different ways, from issuing threats to making hollow promises about meeting the demands of the workers. But not having seen any proper response to their demands in the past months, the workers are determined to continue their protests until they see concrete progress. 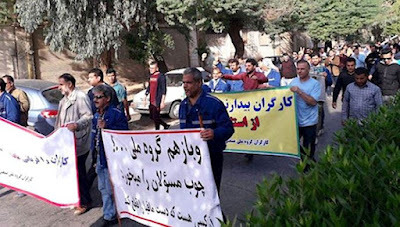 The protests of Ahvaz workers are taking place in tandem with other strikes and protests across Iran due to deteriorating conditions and government corruption.